Has it ever occurred to you that you can record a meeting chat on your PC? Or have you ever thought to capture what you listen from an online radio? Like Zoe, whether it is system sound or microphone voice, you can easily grab on Windows with the help of a PC audio recorder. This is the reason why we come here to share following 5 powerful programs. Specialized in recording audio and video activities on desktop in high quality, Joyoshare Screen Recorder is here the first option shown in this list. It is good at record all kinds of audios on Windows and Mac, including Facebook chats, streaming music, broadcasts, online radio, gameplay sound, system voice and any audio from microphone. By means of this audio recorder on PC, you are allowed to set both storage path and shortcuts in the way you like, add image watermark as per actual need and create recording task ahead of time. All that matters is you can choose an output format directly and specify related parameters as you want, such as codec, bit rate, channel and sample rate. It's also available to edit ID3 tag info and trim completed audio. Output audio to MP3, M4A, M4B, M4R, AAC, OGG, etc. Audacity is a best audio recorder for PC. It is undoubtedly a reputable and professional audio tool in current market. Under the help of it, you can not only record digitize audio from other media but also grab live audio from microphone/mixer. 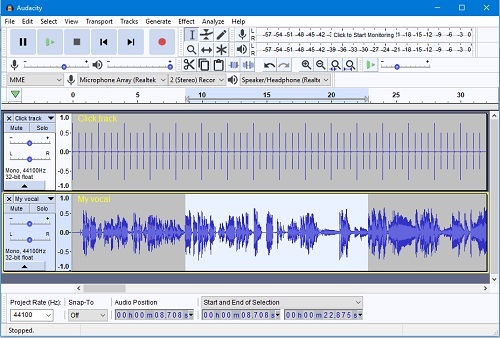 Furthermore, this free and cross-platform audio open source also has ability to edit and combine sound files at a time. It uses high-quality resampling and dithering to convert format and sample rate. During your editing, it enables to cut, delete, copy and paste audios handily and as well supports to undo and redo tracks without limitations. 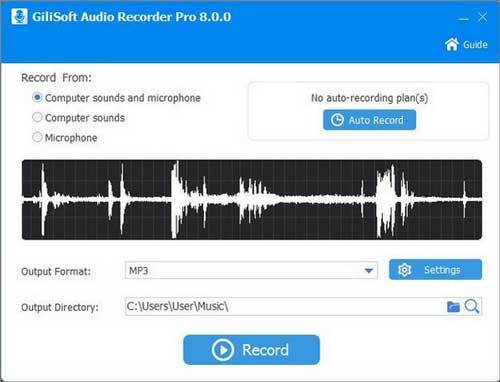 Definitely, GiliSoft Audio Recorder Pro is a top-leading PC audio recorder software, which has a variety of advanced audio recording and editing capabilities. With it, you can readily record computer sound and microphone voice simultaneously, like music from Pandora, YouTube or more streaming audio sites. Most of all, it includes full support to multiple sound card and permits to preview the result before audio recording. More powerful, GiliSoft Audio Recorder Pro is able to set quality and manage parameters to satisfy different needs. 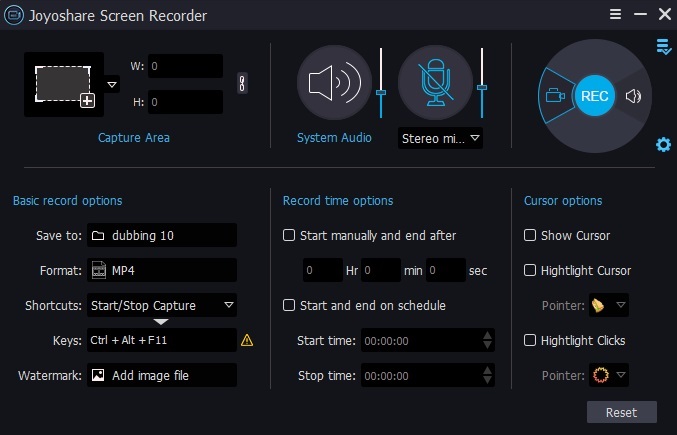 You can even apply it to schedule recording with its built-in timer and pause recording automatically with the silence detection tool. Capture sound reproduced by programs, like iTunes, etc. 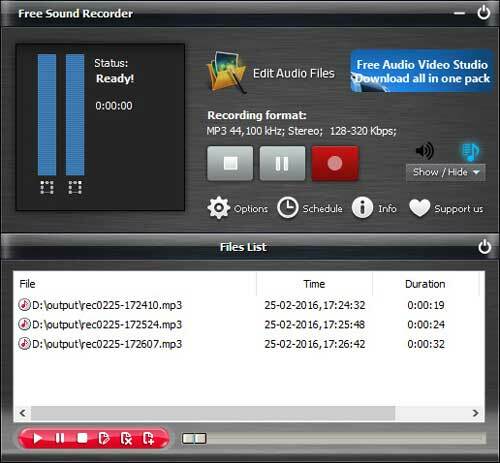 Free Sound Recorder is another well-liked free PC audio recorder that is worth your consideration. It helps to record online music from various sites, such as YouTube, Grooveshark, ect. without charge. Of course, both external and internal sounds on Windows can be supported without any hassle, including CD player, FM radio, RealPlayer, Windows Media Player, Google Talk, etc. What's better, this smart desktop audio recorder is capable of create an audio recording task by defining both start and stop time. Plus, the attractive editing features also gives liberty to flexibly cut, crop, copy, paste and delete audios. There are some marvelous effects, for instance, fade in/out, echo, normalize, amplify, compressor, etc. As the name implies, Apowersoft Free Online Audio Recorder is devoted itself to recording onscreen audios for free. This typical audio recorder for PC is able to capture whatever you want within 3 steps as long as you have installed a launcher. Taking the aid of it, recording audio from radio stations, voice chats, in-game sound and music sites and so forth is completely a simple thing. If you want, you can even capture your own narration and singing from microphone, or add matchable ID3 tag to better manage your own audio recordings. Having checked out this list for 6 best PC audio recorder programs, you must have some ideas of your own. Certainly, it's convenient and apparent for key points. Specifically, for freeware, you can select Audacity, Free Sound Recorder and Apowersoft Free Online Audio Recorder; for advanced one, go to pick up GiliSoft Audio Recorder Pro; for full compatibility and high quality, don't miss Joyoshare Screen Recorder. In order to learn more details, you can also navigate to each official website later.